What else is in store for Harvey and Mike? Has the Suits TV show been cancelled or renewed for a seventh season on USA Network? The television vulture is watching all the latest cancellation and renewal news, so this page is the place to track the status of Suits season seven. Bookmark it, or subscribe for the latest updates. Remember, the television vulture is watching your shows. Are you? Airing on the USA Network cable channel, Suits stars Gabriel Macht, Patrick J. Adams, Rick Hoffman, Sarah Rafferty, and Meghan Markle. A legal drama, the Suits TV show revolves around the exploits of superstar attorney Harvey Spector (Macht) and his college dropout protegé Mike Ross (Adams). In season six, Mike deals with the harsh realities of prison life, then must adapt, again to life on the outside with fiancé Rachel (Markle). Jessica Pearson (Gina Torres) saved a death row inmate, then saved herself by quitting the law firm. With Pearson Specter Litt’s troubles at a peak,‎ Donna (Rafferty) must help bring them all together to not only save the firm, but also the friendships they have all dedicated their entire career and lives to. Meanwhile, Louis (Hoffman) proposes to his pregnant girlfriend, Tara (Carly Pope). The sixth season of Suits averaged a 0.42 rating in the 18-49 demographic and 1.60 million viewers. Compared to season five, that’s down by 26% in the demo and down by 20% in viewership. Check out how Suits stacks up against USA’s other scripted TV shows. On August 3, 2016, Suits was renewed for a seventh season. It debuted on July 12, 2017. Although its ratings are only half of what they were in the show’s premiere season, USA renewed Suits for a seventh season, anyhow. That’s likely because, despite the drop-off, the series remains one of the cable channel’s top performers. Despite the renewal, I’ll keep my eye on Suits‘ season six ratings and update this page, periodically. After all, sometimes even renewals get cancelled. Check the rankings for all of USA Network’s TV shows. Find more Suits TV series news or other USA Network TV show news. What do you think? Are you glad the Suits TV show was renewed for a seventh season? How would you feel if USA Network cancelled this TV show, instead? 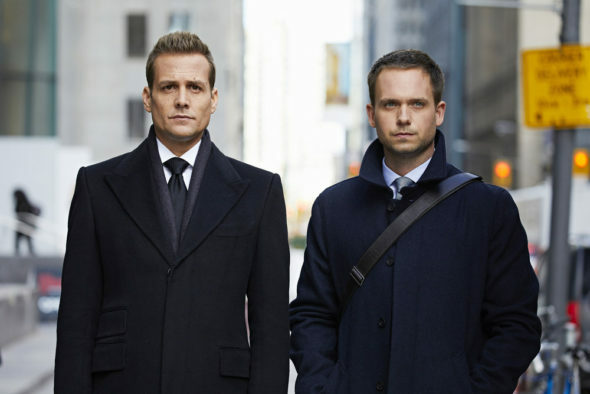 More about: Suits, Suits: canceled or renewed?, Suits: ratings, USA Network TV shows: canceled or renewed? Suits on USA: Cancelled or Renewed for Season Nine? It no doubt getting renewed positive about it top rated for years just down little bite that why. Are you serious? Cancelled? This is one of the best shows out there, way better than Scandal and How to get away with murder. Sooo glad its renewed! Cant wait! I love Suits and am glad it is renewed for a seventh season! They would never take “Suits” away from me! There are not many interesting drama-filled shows for them to cancel it. USA needs a thoughtful sometimes humorous and polished show such as “Suits” so there is every reason to have more seasons. Moreover, there are still so many more stories to tell; not just about Harvey and Mike but there is temperament with Louis, Donna and the rest of the cast. I just know the talented writers have more to tell about how the firm continues to struggle to grow and outside help to defend versatile clients.